Shopna’s story begins in her village called Kauartec which is in Manpura upozilla of Bhola district in the area of Barisal. Her story is a familiar one in that area where most of the women are married to fishermen who catch the Hilsha fish. The Hilsa fish is the national fish of Bangladesh. Shopna has two sons who are 10 years old and 3 years old. Her dream is for them to get an education. 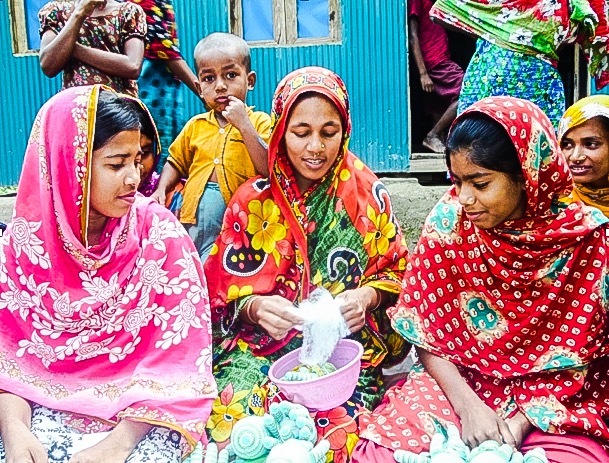 The community spirit in her village is strong because most women are in the same position. Most women dream of educating their children in order that they will have more opportunity in their lives. Shopna also dreams of helping her community and the other women in the village. ECOFISH project is jointly collaborated by WorldFish , USAID and Government of Bangladesh (GoB). It aims to reduce poverty and hunger by improving fisheries and aquaculture. Fishing and fisheries are a complex issue since it isn’t just about enabling people to be able to catch more fish. Catching too many fish can result in depletion of fishing stocks. In Bangladesh the Hilsha is often in an endangered situation. When this happens the Government will ban fishing of Hilsha for some time. This enables the fish to grow and ensures that fish that are too young are not caught. In turn ensuring sustainability in the industry. 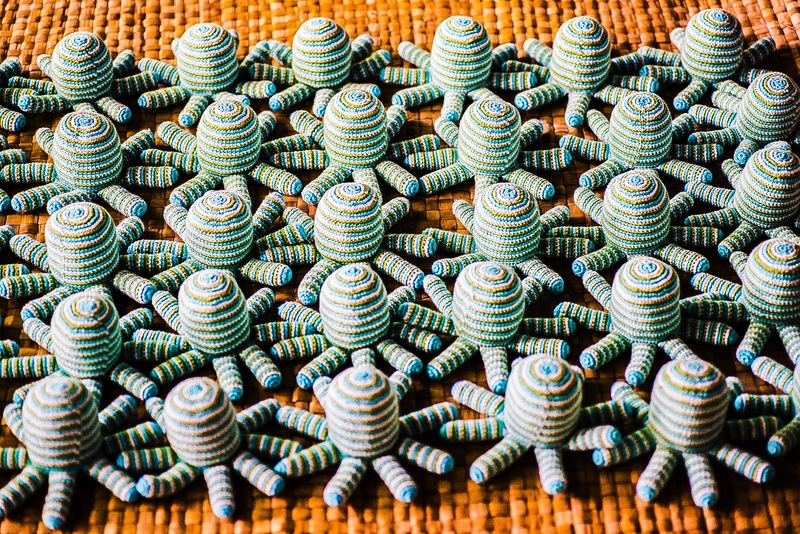 Image: Shopna shows the women how to make Pebble toys and then supervises their production to make these unfinished octopus rattles. In the Pebble model finishing of the toys is not done in the rural production centres. So it was great that ECOFISH wanted to partner with Hathay Bunano to provide training to the women in the fishing communities. This way when fishing is low the families will have an alternative income. It was through this collaboration that Shopna received training from Hathay Bunano to make Pebble toys. She was committed and determined to succeed. Following successful completion of her training she then did an additional written and practical test. Passing with flying colours, she was appointed the supervisor for the Hathay Bunano rural production centre in her area. It’s this sort of endorsement that keeps us working. We hope that you buy Pebble toys because you love them. But we also hope that you are happy about the changes and opportunities you are bringing to people miles away and we are delighted that you are a conscious consumer and recognise the opportunities and impact your shopping can bring.